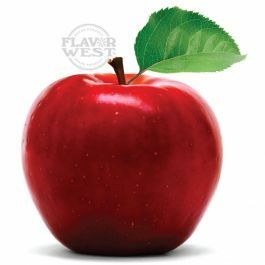 Natural red apple flavor extract is sweet, crisp and succulent fruity taste flavoring that you won't want to resist. It can be used to flavor all sorts of recipes. Good for baked treats and smoothies. Use natural red apple flavor to create unique desserts and pastries. No artificial sweeteners. Type: Red Apple All Natural Water Soluble Flavoring. Ingredients: Natural Flavoring, Propylene Glycol. USP Kosher Grade Flavoring. Usage Rate: 15-20% for E-use. Flavor suitability: Suitable for t drinks, pastries, ice cream, yogurt, confectionary, lip balm and more. Specific Gravity: 1.17 No Refunds on Flavoring.